Two days of Poconos fun for one awesome price. Paddles & Pedals – also known as Rail Trail Biking and Pocono Whitewater Rafting. This is the best way to view the Lehigh Gorge State Park in the Pocono Mountains. On your first day, you’ll enjoy an easy and scenic biking day-trip on the Lehigh Gorge Rail Trail. The following day, change the pace and go whitewater rafting on the beautiful Lehigh River in Jim Thorpe. This is the perfect two day getaway for one discounted rate. 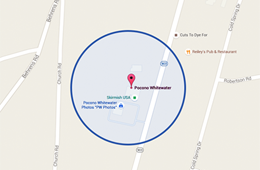 If you would like to reserve a two day Paddles and Pedals Adventure in the Poconos, please give us a call at 1-800-Whitewater (1-800-944-8392). 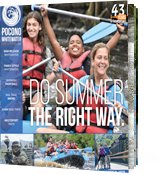 If you would like to reserve a two day Pocono Whitewater Paddles and Pedals Adventure, please give us a call at 1-800-Whitewater (1-800-944-8392). Each raft will accommodate 4 to 6 people. If you forget something you can pick it up in our retail shop. Your photo is taken on the river. If you need overnight accommodations in the Jim Thorpe or surrounding area, please visit our Lodging Page for a complete listing.